Does this sound like you . . . ? Does your workplace struggle with low energy, poor performance, and disengagement? Do you wish your employees would figure out how to solve their problems and be leaders themselves without always turning to you? Do you wish people would be more authentic and honest at work? Are you lying in bed awake at night stressed out about how to attract the best and brightest talent, scale your culture, and still deliver growth? If that sounds like you, then you’re in the right place! Hi everyone! This is Traci and today we are going to explore the 5-step strategy to unlocking your fullest potential, purpose, and power so that you can lead yourself – and others – with freedom rather than fear and control. Are you climbing the ladder to the top, and have just taken on a new leadership role of a department or team? Maybe you’re in charge of developing leaders throughout your organization? Or maybe you’re a business owner or C-suite leader who has already made it to the top, but you’re still searching for how to be an even better and more effective leader? Do you wish you had a clearer purpose and direction for your life, but you still have no idea how to find it? Do you long to lead others, but you still don’t have the confidence and skills to do so? Do you want to go to the next level in your career, but you’re still not sure how to get there? Do you want to communicate more clearly, but you still don’t know how? Do you want to believe in yourself more, but the “gremlins” in your head keep holding you back? Do you want to help your employees become better leaders, but you’re still searching for the best way to fully develop them? Most importantly, are you still looking for a way to make sure you’re handling the (often subtle!) fear in your thinking so you can really LEAD, rather than control, others? The top leaders we’ve worked with in over 65 countries have found THEIR answers to these questions, and MORE, using our PROVEN 5-step strategy that I’m going to share with you today. They’ve experienced real transformation, unlocking their fullest potential, purpose, and power so they can lead themselves, and others, from a place of freedom, rather than fear and control. The problem is that most of the time we think leadership development means learning certain skills that can help advance your career, like taking that additional finance course or learning how to be a better public speaker. Or we think that simply reading a book, watching an online talk, or taking that one-day workshop will instantly turn us into a great leader. Even WORSE, I’ve met people who think that just because they are the business owner or got a new leadership title at work they have now magically become a great leader! While it’s good to develop key skills, and on-going learning can support your continuous development, these activities are just about information. NONE of these activities are about real and lasting TRANSFORMATION that will develop you into the world-class leader I believe you’re destined to become. It’s scary, but research shows most people who voluntarily leave their job are leaving because of a bad manger or leader. Are you one of those leaders that people are running FROM? Well today, I want to talk with you about the 5-steps you can make to be a leader that everyone is running TO! There are 5 shifts the TOP leaders know for how to unlock their fullest potential, purpose, and power – and the full potential of others as well. Once you make these 5 shifts, you will . . . Understand the COMPLETE model for how to become a freedom-centered, rather than fear-based leader. Unlock a new level of clarity, courage AND confidence for how to inspire and lead others successfully. Know how to identify and overcome the BIGGEST roadblock that any leader must face. Unlock your FULL potential in order to live a meaningful and purposeful life that serves others. Know how to cultivate and develop leadership potential in OTHERS faster and more easily.
. . . AND you will learn how to do all of this while developing transferable leadership skills and behaviors needed for your entire lifetime. Now let me take a moment and tell you how I discovered the 5 shifts. My team and I have been doing leadership development work for over twenty years, and we have impacted thousands of leaders in all different industries all over the world by teaching them how become TOP leaders that others LOVE to work with. We’ve worked with leaders at widely admired brands such as Zappos, WD-40, Hulu, Pandora, DaVita, Menlo Innovations, Mindvalley, and hundreds more organizations globally. I’ve taught these ideas at Harvard, Yale, the US Naval Academy, TEDx, SXSW the CIA and dozens more locations around the world. And we’ve had the privilege of having our work recognized in Fortune, Forbes, Fast Company, The Wall Street Journal, New York Times, Inc. Magazine, BBC, NPR and many other media outlets around the world as well as in over three dozen books. Along the way, I realized that there was a HUGE difference between those individuals who were unlocking their fullest potential, purpose, and power to lead with freedom rather than fear and control -- and those who were NOT. Over time I started to look at what those top achieving leaders were doing -- and what the others weren’t doing -- and I realized that there were 5 shifts that those TOP super-star leaders were making that others weren’t at all. I started sharing the secrets I discovered that these top achievers were doing (that everyone else wasn’t!) with OUR clients and they started seeing unbelievable results. So the bottom-line line is this . . . There are 5 key shifts you MUST make in order to unlock your fullest potential, purpose, and power to become a world-class, freedom-centered leader. I’m going to walk you through all five shifts in this podcast now. The first shift is to Accept Your Moral Responsibility to Lead. I believe that every single one of us can make the choice to lead, and it is our moral responsibility to do so, regardless of your title, how much money you make, what you do professionally, how old you are, where you live or anything else. We ALL have a moral responsibility to lead, begin with learning how to lead ourselves. Now I know you want to learn all the cool leadership ideas, and believe me, we’re going to get to that, but first I have to talk about the responsibility of individuals to ACCEPT THEIR MORAL REPONSIBILITY TO LEAD first, because without this, nothing else matters. 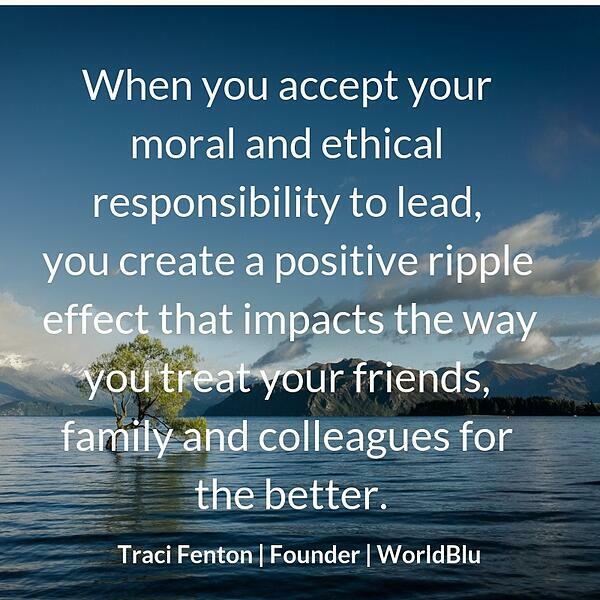 When you accept your moral and ethical responsibility to lead, this creates a positive ripple effect that impacts the way you treat your friends, family, and colleagues in a POSITIVE way. This builds a sense of worth and dignity for each person that they inevitably pass along to those around them. Making the CHOICE to lead, positively impacts our communities and those with whom we interact -- ultimately rippling out to improve our world as a whole. This is WHY we must accept each day the moral responsibility we have to lead. Now, let’s look at the 2nd shift . . . The second shift is this – Lead using freedom -- not fear. 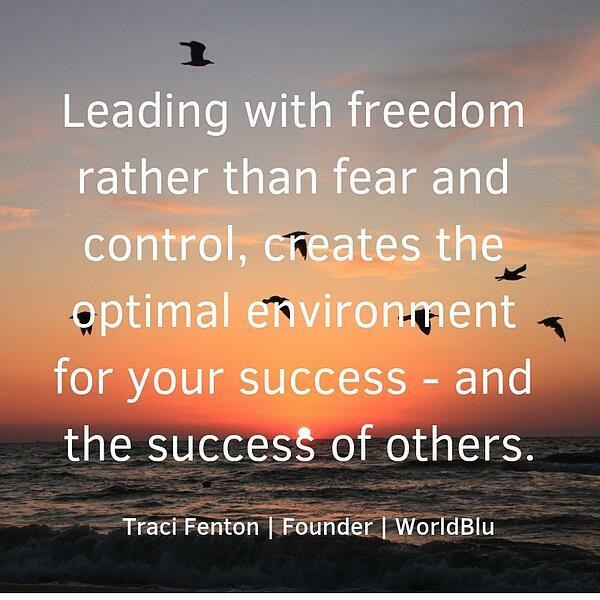 Leading with freedom rather than fear and control, creates the optimal environment for your success -- and the success of others. However, most of the time, we are leading with fear and we don’t even realize it! This destructive mindset and leadership style impacts the way we lead ourselves and others. The biggest source of almost ALL our problems is a 4-letter word that starts with an “f” – and that’s FEAR. Fear is the REAL problem you’re dealing with as a leader, and freedom, not fear and control, is proven to create the optimal conditions for leadership success. The problem is we end up wasting thousands of dollars and hundreds of hours of our time with Band-Aid solutions and one-off trainings that don’t develop world-class leaders because they don’t address the #1 problem holding most people back from developing INTO REAL leaders – and that’s knowing how to identify and handle fear. What do I mean by fear? Well, let’s take a look at some of the symptoms of fear in our lives. . . . Most of the time, we’re operating in fear and we don’t even know it. But to be a world-class leader, unlocking your fullest potential, purpose, and power, we have to learn how to lead from a place of freedom rather than fear. A recent article in the Harvard Business Review had top leaders reporting over 500 negative consequences from leading with fear. Have you ever experienced any of these consequences of fear? I bet you, like most people, have! I know I have! In fact, according to The Herman Group, 75 percent of employees who voluntarily leave their jobs say they’re not pursuing other interests or chasing more money—they’re escaping bad managers and poor leadership. . . . . So, are YOU leading yourself and others from a place of FREEDOM – or fear? If you’re leading with fear, just what it is costing you – and your organization, your family, your well-being-- each and every day? If you continue to let fear call the shots and do nothing to learn how to address the fear, the problems you are facing right now will continue to deepen and multiply and you will NEVER become the world-class leader you are meant to be. But if you DO get this right, decide to take action, and turn things around, the benefits will be HUGE, including unlocking your fullest potential, purpose and power to lead yourself, and others, from a place of strength and possibility. Now, let’s look at the 3rd shift . . . The third shift is to use our proven model: Freedom-Centered Leadership. The Freedom-Centered Leadership model is a PROVEN model to becoming a world-class Freedom-Centered, rather than fear-based, leader. Our model teaches you how unlock your fullest potential, purpose and power to lead with confidence, courage and conviction. Freedom-centered leadership is about practicing three core attributes. You can picture it like a three-legged stool, with each leg equally important and needed. The first Freedom-Centered Leader attribute is LOVE. Love relates to self-worth, and is the #1 starting place to becoming a top leader. Until we learn to love ourselves first, we simply cannot effectively lead others. Self-worth is the key place to start developing yourself as a leader, and yet it is the place most people and leadership training programs completely overlook. The second attribute of Freedom-Centered Leadership is about understanding true POWER and how to lead using freedom-centered, rather than fear-based power. Knowing how to be in our power in the RIGHT way relates most closely with an ability to self-manage and self-govern effectively. The third and last attribute of a Freedom-Centered Leaders is practicing “Ubuntu”, which is a term used throughout Southern Africa, the place I first learned it when I was there years ago. It means, “I can only be at my best when you’re at YOUR best, and you can only be at your best when I am at ME best because we are ONE.” This concept helps us develop a stronger sense of self-knowledge. What we know from working with thousands of leaders ALL OVER THE WORLD is that when all three attributes of Freedom-Centered Leadership– Power, Love and Ubuntu – are embraced and actively practiced by an individual, it WILL turn them into a world-class leader who is living their fullest potential and unleashing the potential of others around them, ultimately transforming their team, organization, and our world for the better. Now, let’s take a look at the 4th shift you need to make to become a top leader . . . The 4th shift is to Know Your Purpose For Your Life. I know from my own personal experience that my work with a mentor early in my adult life, who helped me discover MY purpose, had a HUGE impact on helping me find the clarity, courage and conviction I needed to build a global company that’s transforming our world for the better. I never would have achieved the level of success I have without knowing my purpose first. Knowing my purpose has also given me an inner peace and deep joy because I know why I am here and what I am meant to give to the world. Accept Your Moral Responsibility to Lead. Lead using Freedom -- not fear. Use our proven model: Freedom-Centered Leadership. The 5th shift is this – Stop Trying to figure this out on your own. The new way to develop as a leader isn’t about one-off workshops, reading another book or watching yet another online talk -- it’s about engaging in a learning journey that is committed to real transformation – not just informational Band-aids – and accelerate your leadership journey to breakthrough growth and success. Delivered not through yet another workshop that you forget in a week, but delivered through gamification. Gamified learning is PROVEN to be not only the most effective way to learn, but the method that delivers the highest retention rate of the learning overall. It must involve peer-to-peer learning, which is proven to be one of the more effective and engaging ways to learn and develop. It must expect that you demonstrate retention and excellence in your work. It must be experiential and immediately applicable – not just theoretical. And it must be supported with transformational coaching support and a global learning tribe. Here at the WorldBlu Academy, we’ve had leaders from over 65 countries worldwide participate in our 12-week Freedom-Centered Leader transformational course, delivered through our cutting-edge leadership gamification platform and supported with coaching, peer-to-peer learning, and experiential activities. Leaders in the 65 countries we’ve worked with worldwide have consistently found our course to be one of the most transformational and substantial leadership development programs they’ve ever experienced. The Freedom-Centered Leader program has transformed individuals all over the world into world-class FREEDOM-centered rather than fear-based leaders, changing themselves, their teams, their organizations, and our world for the better. Remember, trying to become a world-class leader without a PROVEN STRATEGY to get you there is highly ineffective and disempowering, wasting your time and money. Stop trying to figure this out on your own. Find the BEST leadership coach out there and spend what it takes to work with them to get the results you – and the people you lead each day – deserve. A COMPLETE model for leading with your full potential, purpose and power. The #1 starting place that most people miss for creating the optimal conditions for leadership success. How to uncover the BIGGEST problem holding you back from becoming a world-class leader. The 3 core attributes every leader MUST have to thrive in today’s dynamic & interconnected world. What you must do in order to have a truly transformational rather than transactional leadership development experience. AND the #1 thing you must do in order to sustain leadership success over the long-term. We explored the 5-steps to unlocking your fullest potential, purpose, and power so you can lead yourself – and others -- with freedom rather than fear and control. Lead with Freedom, not fear. Know your purpose for your life. Stop Trying To Figure This Out On Your Own. Invest in a transformational leadership course and coach. Practicing these five shifts are enough to propel you towards becoming a Freedom-Centered rather than fear-based leader, unlocking your fullest potential to live your purpose and power in a way that transforms your team, organization, and life. Thanks so much for joining me and remember to live, lead, and work in freedom!